CCC's Animal Crossing: City Folk Launch Site: Reviews, Previews, Cheats, Videos, Screenshots, Info, and more! Animal Crossing finally made its way to the Wii! There�s always something new to do in the living, breathing world of Animal Crossing: City Folk. Days and seasons pass in real time, so there�s always something to discover. Catch fireflies in the summer, go trick-or-treating on Halloween or hunt for eggs on Bunny Day. 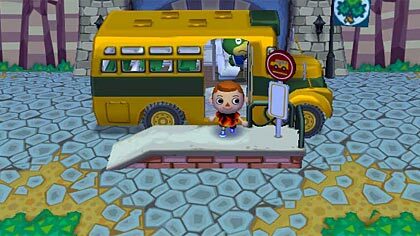 If you�re in the mood for something a little faster paced, take a bus to a new urban city area that�s unique to Animal Crossing: City Folk. There you can catch a show at the theater or check out the sales at Gracie�s boutique. Up to four people from your household can live and work together to build the perfect town. Design clothes and patterns, write letters and post messages on the bulletin board for each other, or invite up to three friends to visit your town using Nintendo Wi-Fi Connection. With the new WiiSpeak microphone, it�s like you�re all in the same room. The microphone sits atop the sensor bar and picks up the conversation of everyone in the room to encourage a more inclusive experience. Get to know your neighbors. The heart of Animal Crossing: City Folk is building relationships with the animals in your town as well as with other players. Befriend your animal neighbors by exchanging letters, gifts and favors. Animals can also move from town to town, bringing their memories and stories from their old towns with them. Express your personal style. Customize your town, your house and yourself by collecting bugs, fish, fossils, art, furniture, clothes and accessories. You can also go to the salon in the city to change your hairstyle and get a Mii makeover. Ready to get the most out of Animal Crossing: City Folk? Don't forget to check out our cheats section, where you'll find cheats, tricks, hints, and everything you need to know about secrets and unlockables included in the game. Keep checking back for more!